You’re staring at your garage door. “It could use a little something,” you think. Sure, it’s a garage door, but it serves a lot more purpose than you would imagine. Something as simple as the color and look of your garage door can completely change the entire appearance of your home or building while also complementing and accenting the other many attributes of your home or business. Raynor is introducing their new Opticolor factory painting program that is offered for Innovations and Traditions Lines which include Affina, Centura, Relante, Masterpiece and Showcase doors. 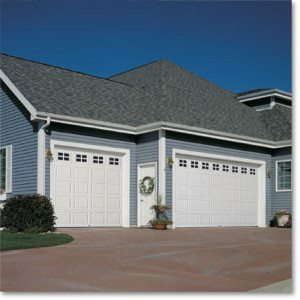 The doors are precisely painted after the section is built, giving homeowners and business owners the exclusive ability to customize their very own garage door color. For once, YOU get the freedom to mix, mesh and experiment! The Opticolor process applies a third layer of paint to the pre-painted and galvanized steel, adding another layer of protection to the garage door. The maximum width for an Opticolor painted door is 18′-2″. With more than 1800 new colors available, this allows the customer the ability to completely customize the color of their garage door. The full assortment of paint colors available through the Opticolor factory paint program can be found by contacting FS Construction Services. We’ll be here through your entire paint process! Contact FS Construction Services today to receive more information on how to brighten up and color-tize your very own home or business.